This story begins with an ice-lolly stick. Its sweetness gone, it lies discarded and lonely until a little girl called Rosie comes along. She places it carefully in her cigar box, full of other sticks. Without our ice-lollies we are nothing, says an old stick. But new stick wants to BE something and into the minds of all the old sticks, he plants dreams maybe they can be something, too. What about Rosie and her dreams that night? She dreams of helping her parents pay the bills. And so, at the stroke of midnight, magic and dreams collide and a HORSE gallops out of the cigar box! His name is Stickerino. Where to? he asks Rosie. Anywhere with treasure! she answers and hops on its back. Then begins an adventure like no other ice-lolly mountains by the sea, caskets of gold, and pirates foiled by a stickling ice-cream van. I have always valued children's picture books that encourage kids to use their imaginations. Taking something as simple as a stick and turning it into a horse is what all kids can do. 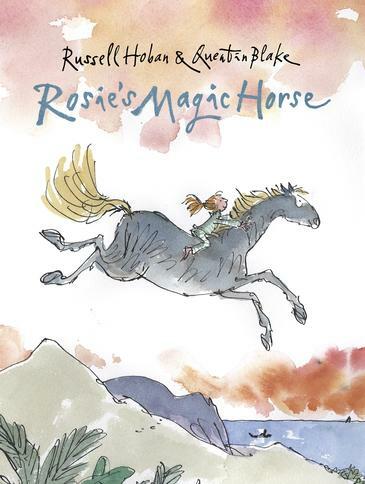 In Rosie's Magic Horse, Hoban and Blake progress from there into a magical landscape where anything is possible, so long as we can dream. Quentin Blake is a master illustrator. I love the way his line art is not precise in detail, but expert in conveying movement, expression, nuance and humour. Russell Hoban takes us on a wild adventure where ice block sticks become horses and horses become ice cream vans and vans explode into pirate-tickling sticks. Kids will enjoy this story. It's the sort that stays with us, long after we've listened to it or read it for ourselves. They'll enjoy the adventures, the magical happenings, the quirky characters conjured for us by Hoban and Blake. I love the implicit message that we should ignore the naysayers and follow our dreams, a message I hope all our kids will understand and remember. My review edition is a lovely sturdy hardback, perfect for home or library use. Love that you are focusing on nonfiction - that's my passion right now! Hi Lauren, I loved reading about your Star system. Your enthusiasm for teaching really shines through! Using their imaginations and following their dreams are both so important for children to learn and develop. Sounds like a wonderful book. I hope you can find it Kriss - it's on Amazon UK, so I'm tipping it will be available. I agree with you....really do love the art work! I can totally see the appeal of this book - especially for young girls who love horses (that would have been me growing up!) The illustrations do seem fitting.